We finally made it to Georgia! The road trip was beautiful but to tell you the truth I’m happy to be out of the car. Sitting down for that long everyday gets old real fast. Our belongings should *hopefully* be arriving in the next couple of days then the unpacking will officially begin. I can’t even begin to tell you how excited I am to get the kitchen set up. The first thing I’m going to do is break in the oven with a loaf of pumpkin bread. Cannot wait. So today’s recipe might look familiar to some of you and that’s because it’s been on my site for a couple of years. 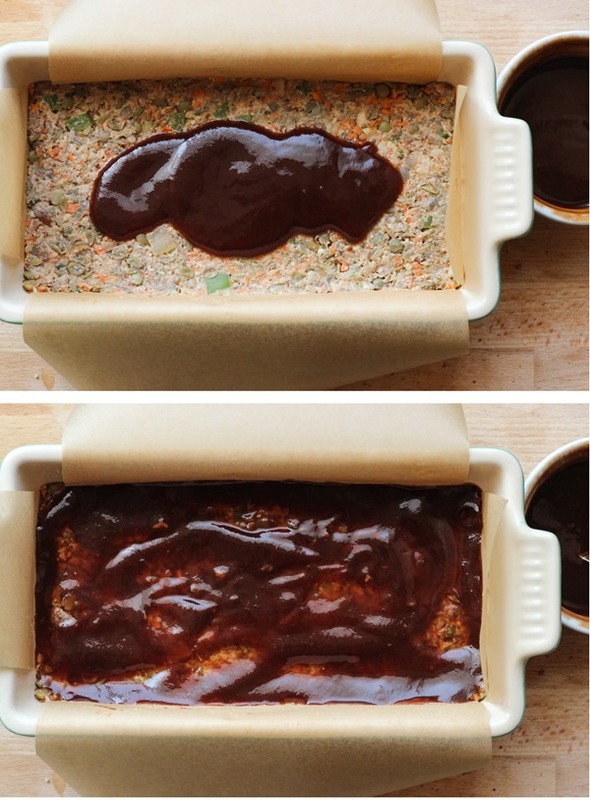 It’s my favorite lentil loaf of all-time but I felt like the original pictures didn’t quite do it justice. I figured with the holidays coming up, now would be the perfect time to give it a little facelift! The ingredients are fairly similar to my lentil burgers except I made it vegan by replacing the egg with ground chia seed (you could also use ground flax) and added mushrooms to help give it a nice, meaty texture. First we start by cooking the lentils with vegetable broth and then lightly sauté onion, mushrooms, garlic, carrots, and green bell pepper. I like to use green pepper because I hate celery but you can sub that if you prefer. After that we gently mash half of the lentils and place them in a large bowl along with the cooked vegetables, oats, ground flax or chia, walnuts, sunflower seeds, breadcrumbs and plenty of herbs. Mix that in with a little tomato paste and vegan Worcestershire and then mash into a loaf pan lined with parchment paper (optional but recommended to prevent pan stickage). Lastly, we top it off with a balsamic tomato sauce (okay, it’s actually ketchup but you can use tomato sauce or paste if you’re a ketchup hater) and bake in the oven for 40-45 minutes. Then voila! A perfectly firm and ridiculously healthy loaf awaits you. Serve it with your favorite vegetables for a comforting meal that your body will thank you for! Rinse the lentils and then combine them with the vegetable broth in a medium-size pot over high heat. Bring to a boil and then reduce heat to low and simmer for about 30 minutes. Once they are tender drain them and then set aside in a large bowl. Next preheat the oven to 375°F and line two loaf pans with parchment paper. (If you only have one loaf pan, you can cook each loaf one at a time or half the recipe.) Combine the ground chia seed (or flax) with water and then set aside to thicken. Using a food processor, finely chop the onion, garlic, mushroom and pepper by pulsing a few times. Warm about 2 tablespoons olive oil in a large skillet over medium-heat and then add the onion. Sprinkle with salt & pepper then cook for 2-3 minutes, until translucent. Add the mushrooms, garlic, carrot and green pepper then cook for about 10 minutes. Remove from heat and set aside. Using the food processor again, mash half of the lentils by pulsing a few times. Add them back to the bowl along with the remaining lentils and sautéed vegetables. 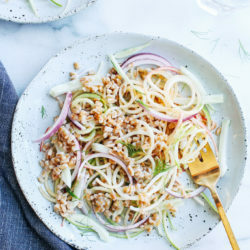 Process the remaining ingredients to finely chop (oats for oat flour, bread for breadcrumbs, walnuts and sunflower seeds) then add them to the bowl along with the herbs. Mix the Worcestershire and the tomato paste into the chia seed mixture and then add to the bowl. Stir everything together until the liquid is evenly distributed. Pour half of the mixture into each loaf pan then smooth it down with a spatula (or the back of the spoon) to create the shape of a loaf. Lastly, combine the ingredients for the balsamic glaze in a small bowl and mix together. Spread it over the top of each loaf then cook in the oven for 40-45 minutes. Allow to cool for about 10-15 minutes before serving. If you would like to freeze this recipe, allow it to cool completely before transferring to an airtight container, then freeze. When ready to serve, defrost at room temperature then reheat in the oven at 350 degrees for 20 minutes, or until heated through. This looks delicious! 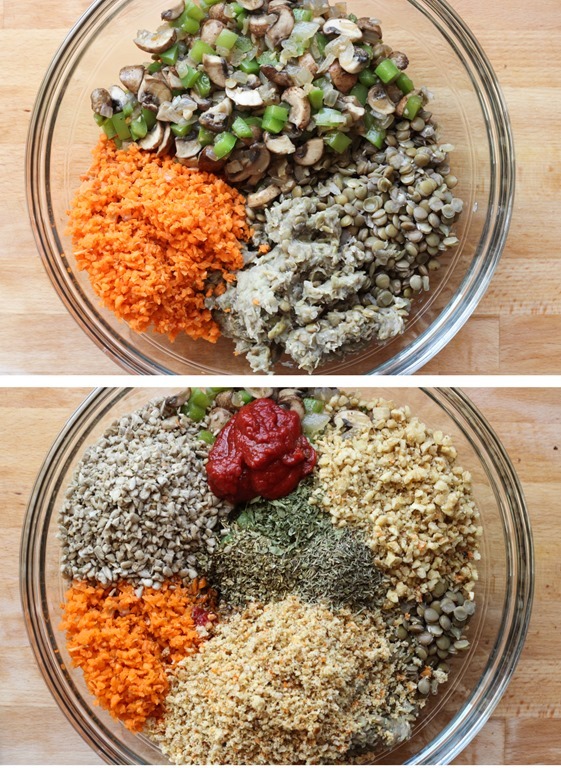 I’ve never tried making a lentil loaf but it looks awesome and YAY for vegetarian protein! This looks delicious! 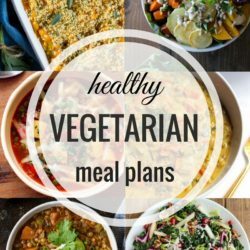 I am going to share this recipe with my mother and sister who are vegetarian too. Enjoy the rest of your trip! mmm, my idea of fall comfort food. safe travels back to cali! I seriously LOVE lentil loafs! I have never added mushrooms to mine, though, so I will have to try that. I LOVE your balsamic glaze recipe idea too! I totally agree, leaving the pets is always so hard it makes me just want to stay at home! I’m glad you guys had such a great time and all that cheese sounds so good! 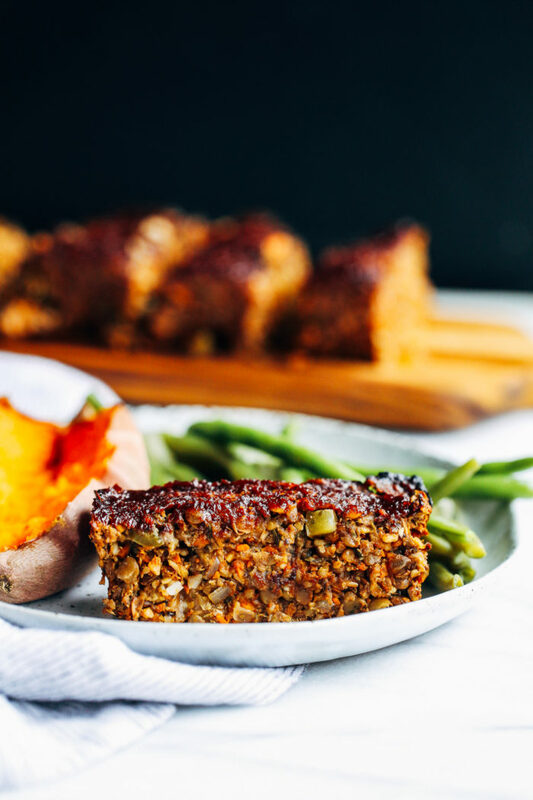 But I don’t blame you at all for craving this mushroom lentil loaf, it looks so good! I really need to make this soon, no joke! And I love the balsamic ketchup on top! 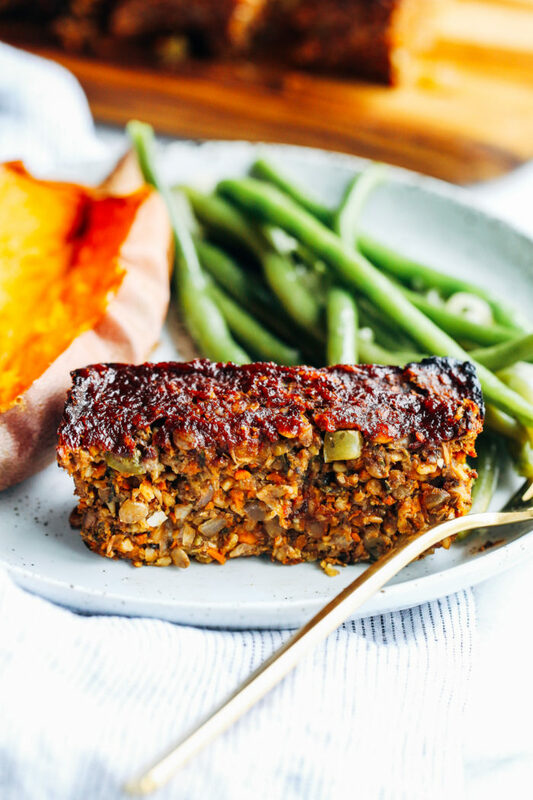 I have recently tried a vegetarian version of haggis that looks very much like your lentil loaf. Haggis is traditional Scottish sausage made from a sheep’s stomach stuffed with diced sheep’s liver, lungs and heart, oatmeal… bleah! The vegetarian version was really tasty and full of lentils. Can you imagine I have never prepared a lentil loaf? This well illustrated recipe inspired me to make my very first lentil loaf. Have a safe trip home! I’m already obsessed with your lentil burgers, and these remind me of those bad boys in loaf form plus a fab sauce!! Pinning. You know your a talented photographer when you can make the most anti-legume person want to faceplant their screen. I’ve actually been looking for more ways to use lentils – I always love eating them, but I’m terrible at cooking them. This mushroom loaf sounds just up my alley – I’m pinning it to remember to make! Very nice recipe but I could do without all the travel diary yakitty yak. But maybe your followers like that. And the photography is stunning. WOW!!! SOOOO amazing!!! I made this recipe for my vegetarian family for Easter dinner and it is so wonderful. 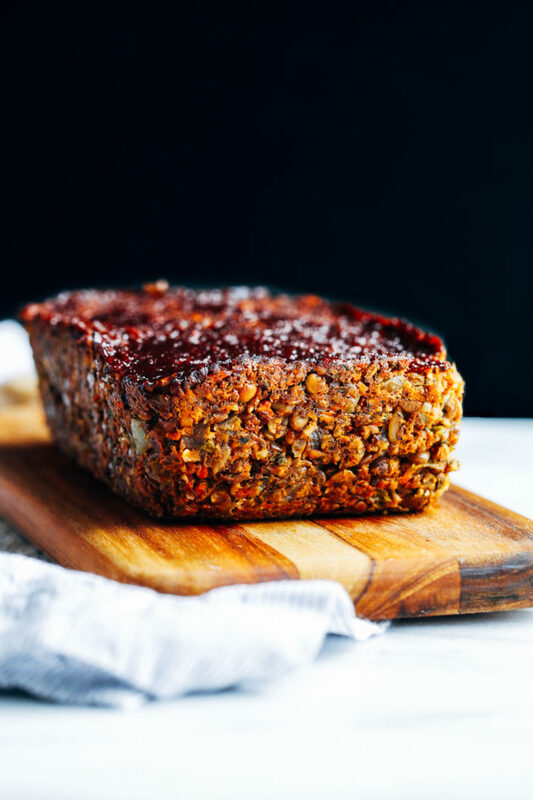 I have made several different lentil loaf recipes in the past and this one is far superior! Love the glaze and minimal bread/bread crumb content. Thanks, I will enjoy making and eating this recipe for many years to come! Would you have nutritional info? Yay, so excited you made it! Can’t wait to hear updates on how you’re settling in. Looks delish and hearty – perfect for a Fall evening. Looking forward to trying it! If I used eggs, how many would you recommend? I made and LOVED your recipe. Wow, it was so satisfying. I did leave out the chia/flax bit, and subbed in one egg, still following the recipe as if I’d done the chia/flax. It was perfect, delicious, amazing. So happy to hear that! Thanks Sharan! This loaf did look familiar, and you know what? When I saw it the first time I wanted to try it but never wound up doing so…. so this time I’m going to make it! I love lentils. And YAY for getting to Georgia! I know what you mean, I love road trips but at some point I get over being in the car so much. Made this recently and loved it. Turned out well when following the recipe. Make sure to let it sit for at least ten minutes after removing from oven to keep it from falling apart. Sauce on top is delicious. Ended up making enough to eat one loaf (in one night for two people) and freezing the other for future dinners. This is a healthy, nutritious recipe that satisfies. Mm Mm! Made this tonight … Soon good! Well worth the prep. Definitely a make again! And … Plenty left for a leftover meal to look forward to & one whole one to freeze … Awesome! This is a really delicious tasting loaf. 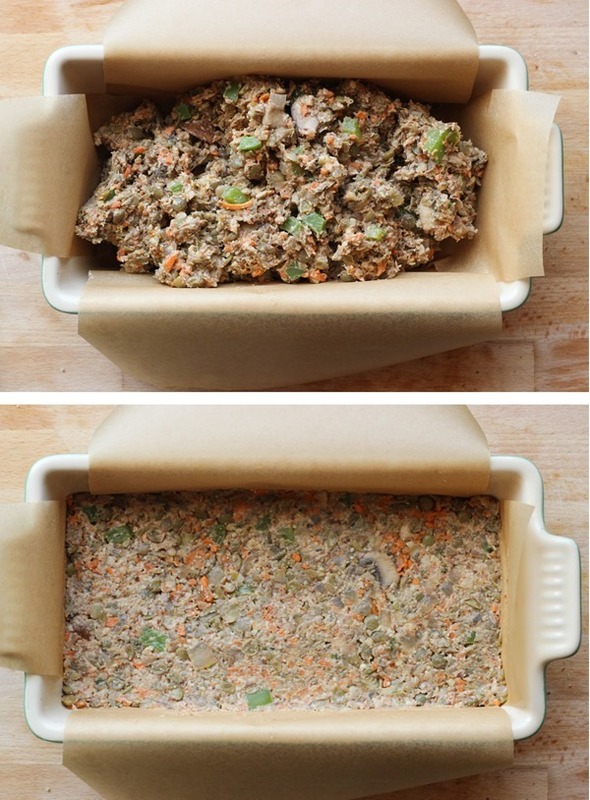 It is the best veggie loaf recipe I’ve ever tried and there have been many. It is somewhat time consuming but yields two good size loaves and 1/2 loaf will feed two or three people. So basically 4 great meals depending on family size. I replaced the onion with more carrots and celery due to a family member’s allergies. I used brown rice flour and 1/2 c. each gluten free breadcrumbs and garbanzo flour since that’s what I had on hand. I also used an egg. I want to try this again maybe replacing some of the flour either with oatmeal or cooked rice as my only reservation is that it is a little dense if using the flours I used. I’d like to know how wet the batter should be. I spooned it into the pans since mine was pretty thick. But the end result was not too dry. Thanks for a great recipe. Hi Lark! Thank you so much for your comment and feedback. When I make the loaf it doesn’t come out that dense but I haven’t tried it with all of your modifications. I’m glad it still tasted good though! 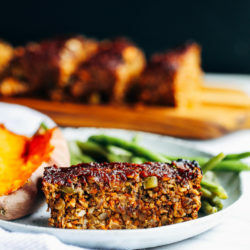 This was my first lentil loaf & loved it! So delicious! I’ve made it twice now & will definitely be making for the next family get together. Thank you! We had this for dinner tonight and it was delicious! I am vegan, sugar-free, and fat-free and it is always appreciated when the food is as good or better than traditional recipies. The only change I made was I water sautéed the onions. Thank you! This was good, but unfortunately not great. I made it exactly as written but using the celery option instead of green pepper. We all agreed at the table that it was a solid 31/2* – which for us is better than average. And we like lentil loaf. I think the garbanzo bean flour gave the loaf a slightly grainy texture. I would use oat flour or even half quick oats and half flour instead. The seasonings were well done – it needed that much oregano and thyme because of the density of the loaf. I’m surprised it didn’t call for salt and pepper. Did you perhaps use roasted, salted sunflower seeds? I used raw and it needed salt, but that was an easy fix. I think perhaps the mushrooms need to be increased and caramelized to give it more mushroom flavor. I am going to make a vegan mushroom sauce/gravy to serve over the leftovers to see if that boosts the flavor profile. Again, good but not great. And it would be nice if people leaving reviews would A) actually make the recipe before reviewing and B) if just leaving comments leave the rating field blank. Just sayin …. this recipe lists a lot of “reviews” but very few people actually commenting on the recipe as they made it. Thanks for the feedback, Ruth. The chickpea flour should not be grainy. Did you grind it yourself? I used raw sunflower seeds but I did write in the instructions to add salt & pepper when cooking the onion. I only used a sprinkle because the glaze adds a good bit of flavor so it doesn’t need a ton of salt. But you are always welcome to add more. As far as the reviews, every single rating is coming from someone who actually made the recipe. The other comments are just comments from fellow bloggers. We comment to support each other. I can’t ask them to stop nor would I want to. I hope you understand. Thanks! Simply delicious! Great texture and the layers of flavor give it depth! I paired it with a side of basil green beans. A wonderful summer meal. Awesome! So happy you enjoyed it, Laura! I shared a link back to you and Pinned this. The post is in my queue so you won’t see it yet. I want to try it as written and then I think I’ll spice in up for a Mexican vegetarian meal. Beautiful photos. I made this recipe a few weeks ago and it made 2 lentil loaves! I purchased pre cooked lentils from Trader Joe’s with no seasoning. Today I will make the recipie again using dry lentils and vegetable stock to increase the flavor profile. Thanks for the heads up on the vegan worsteshire sauce! My father used to call it “What’s this here sauce”! I will also add fresh thyme and sage. In fact I am cooking double the recipe and freeze them in little rectangular baking pans and have it for a quick dinner, whenever I feel like it!! The best vegan loaf in the world!!!! Made it yesterday and it turned out FANTASTIC!! What measurement is a cup?????? I made this tonight. I use a big loaf pan so it only yielded one lentil loaf… but now I’m wondering about how much we eat! LOL! It was four of us. Hubby, my brother, my 3yo and I. We have 1/4 left of the entire loaf! It was fabulous. All the adults and two pieces and my son had one big piece. He loved it! We paired this with a beautiful salad and it really hit the spot! Just made this for our very 1st VEGAN Thanksgiving & it was a huge hit!! Thank you for creating such a tasty main dish. The glaze makes the loaf!! We made a vegan mushroom & onion gravy to drizzle on top & we all felt like we were eating meatloaf! Lol! Will definitely be making this again!! Yay! So happy to hear that. Thank you, India! Hi Sarah. My home smells so good right now after making this. I did not have a loaf pan so I used a 9×9 glass dish. It is absolutely one of the best meals I have ever eaten. One question though, is it supposed to be a little creamy? It has the same consistency of black bean brownies. I used GF flour and GF breadcrumbs otherwise everything was the same. Great pictures too!! Thank you for this as it has found a warm place in our home. Hi Jane, I’m glad you enjoyed the lentil loaf! It shouldn’t be creamy…it’s possible the lentils/veggies were too finely chopped and overcooked. Next time if the mixture seems too mushy, try adding more flour or breadcrumbs until it isn’t as wet. Hopefully that does the trick! This was the best lentil loaf I’ve ever made, loved it. It was more time-consuming than our usual recipe, but we had it for Christmas so it was worth it! Gosh, so many good reviews, sorry to be writing a review to the contrary. Made it as written, with the exception of adding an egg- per the recommendation of another reviewer (added a little extra garlic, too!) Such great ingredients and spices. Both my husband & I thought it was bland (despite so many spices) & texture was gummy. I used garbanzo flour. Wouldn’t make it again. We composted the second loaf. Sorry you didn’t have good results, Catrina. It’s possible the egg is what made it gummy, or maybe that the vegetables and lentils were over blended. But if you followed the recipe to a T and made it with the sauce on top (which adds a lot of flavor), then it seems like this recipe just doesn’t suit your taste. We all have different preferences and as a food blogger, I have to accept that I can’t please everyone. Hi, this is one of the best lentil loafs I ever had. I added in some corn and omitted the walnuts, sunflower seeds and breadcrumbs. It held up pretty well. My family also really loved it. I will be trying this soon again as its a great protein source. The recipe states: ……”Warm the olive oil in a large skillet over medium-heat and then add the onion. ” I don’t see any reference to olive oil in the recipe’s ingredients. 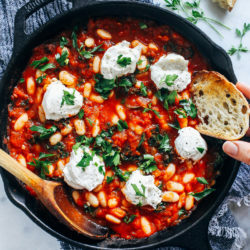 Can you comment on the amount of olive oil needed for this recipe? Just made this. Soooooooooo good. Got nervous so I omitted the nuts; even without the nuts, it was a hit!!! Thanks for sharing. Gives 5 stars… was having problems accessing the stars from my phone. 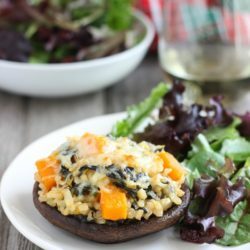 Does the garlic get sauteed initially with the onion or later with the mushrooms/carrots/green peppers? It is not mentioned in the recipe. Or is it added raw to the mixture before baking? It gets cooked with the peppers and carrots. Sorry about that, Alex! I’ll fix it now. I’m a vegan chef in Cape Breton NS and I’ve recently started doing Vegan Dinner Parties at our restaurant on Sunday evenings. Our next dish is going to be exactly this! Can’t wait it looks amazing ❤️ do you have a nice vegan gravy that would compliment this? This recipe has become the ‘go to’ turkey replacement for the vegetarians at all of our holiday dinners. I just noticed that the ingredients say 3 shredded carrots = 1 cup. Yesterday I read this and made it with 3 cups carrots. It was excellent, but just wondering, do you use 1 or 3 cups of shredded carrots? I’m so happy you like this recipe! I usually use 1 cup which I get from buying 3 carrots but that can vary depending on their size. But you are welcome to use more if you like! This was by far the best meatloaf I’ve ever made. I’m on a Nutritarian Diet and have not used beef for over 4 years. I was missing the flavor of a good meatloaf, but didn’t want to eat the beef. This was a wonderful recipe and I will definitely make this again. What a delightful entrée, hearty and flavorful enough to satisfy my omnivorous partner, plant based and nutritious for my taste. Made as written, it was great, although the balsamic glaze made with Trader Joe’s “Gold” balsamic vinegar overwhelmed the great flavors in the loaf. l scraped it off after trying 1 slice and would not bother with it next time. By comparison, a veggie “brown gravy” was oolala delicious and hit all the right notes! I have frozen the second loaf and look forward to seeing if that is as yummy as the first. 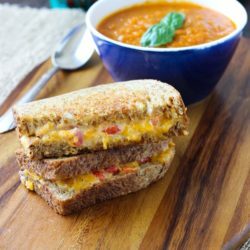 This is a multistep, labor intensive recipe that could use some editing to help first time users but ultimately forgiving enough to reward the cook who perseveres with a tasty finished product. I have made this twice in the last two days! First time (yesterday) – it was good, but for some reason my mix seemed too wet, and it never really baked up like I thought it should. But I could tell it was probably an error on my end, and knew I wanted to make it again. Fast forward to today . . . . when I was thinking about Thanksgiving, and a way to liven up a cornbread dressing, which is a dish my family loves. I started by testing out my old standard cornbread recipe, subbing in whole wheat flour, aqua faba, applesauce, almond milk and raw turbinado sugar to make this fit with a “WFPBNO” eating style. Once I tasted the cornbread which was pretty close to what I was after, I figured it would make good dressing, and I would just use lots of veggies like celery, onion, bell pepper. Then my husband suggested at least adding some mushroom to give it a meaty bite, and then a light bulb went off for me. That lentil mushroom mix, with heavy sage added in, might make a perfect sausage substitution. Guess what? It’s awesome! As someone above mentioned, this is a little labor intensive to prepare, but it makes a LOT and, it’s delicious. I’m only 2-3 months in to my meat-free/dairy free life, and so my recipe quest is fairly young. At least now I can scratch meatloaf off of my “must find a great one” list! Thank you! Thank you for creating such a yummy recipe!!! The glaze makes the loaf very appealing to the eye and the consistency is perfect! Hi… I just bought all the ingredients to make this for the vegans at our Thanksgiving day table. Can you tell me if it can be prepared a day before and baked the next day? Hi… I just bought all the ingredients to make this for the vegans at our Thanksgiving day table. Can you tell me if it can be prepared a day before and baked the next day? Or baked the day before and refrigerated and reheated the next? Yes you can prepare it the day before and then bake the day of. Hope you have a great Thanksgiving! Thank you so much for the recipe! I stumbled across this looking for inspiration for what we had on hand and I can tell you that I would not have come up with this on my own. I imagine it takes quite a bit of tinkering to get something like this to come out just right and I appreciate it! My husband and I have made our fair share of vegan loafs though and agreed that this has been our favorite so far. I think the chickpea flour really helps to bind it together. I did add fresh rosemary and thyme to the lentil’s cooking water and used the last of my ketchup with some miso paste to make up for a lack of tomato paste. We made a different glaze but really enjoyed this with some mushroom onion gravy. Making this recipe now for Thanksgiving, so excited to try it! OK to make a few days ahead of time and bake day of? Or should I go ahead and bake it now (tuesday) for thursday? Thanks! Yes! I would make it ahead and then bake the day of. Thank you… Refrigerate all Ingredients in loaf pan? ~ It’s fairly labor intensive considering how rapidly it disappears, but with practice I will learn to streamline and prep ahead. ~ I used both celery and green bell pepper, adding the celery to the chopped veggies for sauté (Par. 3 of directions). ~ I used half garbanzo bean flour and half fine yellow cornmeal (masa harina). ~ My mixture was finer that that of the loaves pictures, so the consistency was sort of like a veggie pâté. ~ The taste is absolutely delicious, and it sticks together nicely, so it’s easy to serve in a slice. Thanks for sharing this keeper recipe! I subbed two stalks of celery, chopped for the green pepper as my daughter is not a green pepper fan. We also made a change to the glaze that turned out amazing: cut the ketchup to 1/2 c., cut the balsamic to 2 1/2 T., add another t. of maple syrup, then added 2 t. liquid smoke. Huge hit at Thanksgiving this year! That glaze sounds like it was awesome! Glad to hear it was a hit! Hi there! I am making this for Christmas dinner! I was curious if I could make it into muffin tins for easier serving (it is a potluck with 26 people attending). Have you had any experience with that? Thanks in advance! Hey Vanessa! I haven’t tried it as muffins but I think it would work great! Definitely better than in the 11×13 dish. I hope that helps! Merry Christmas! Also, if I don’t make it into muffin tins, do you think it would work in an 11 by 13? I added some softened chopped soy bits along with the veggies. Used the regular white mushrooms. Added a ting of paprika with the onions and some ginger as well. Used garbanzo bean flour. I mixed green and brown lentils coz I didn’t have enough of either. Covered the baking dish. Hope that’s okay as it’s not mentioned in the recipe. Fingers crossed as the dish is in the oven now….. I havne’t made a lentil loaf in ages and it had mushrooms in it. Tasted great but I think I used fresh mushrooms. Would they be okay to substitute for the dry cremini? I’m thinking maybe you use the crimini so they don’t add more liquid to the loaf. Thanks for what looks like a super dish!